The total counteractive force to the flow of electrons through a system is known as impedance. This can be abstractly thought of as the resistance of the circuit, and can be measured with an impedance analyzer. The reality is that no real components, resistors, capacitors, or inductors, are purely resistive or reactive. Every component in existence is a combination of R, C, and L aspects; the unwanted aspects are called parasitics. At low frequencies and in simple applications these parasitics can usually be safely ignored, but in high-speed applications or setups with specific frequency requirements, these parasitics need to be accounted for. The Impedance Analyzer tool from Waveforms will provide a variety of information about the load under test from the impedance, admittance, inductance, capacitance, phase, and quality factor of the system. This is ideal for designing filters with tight specifications and matching impedances. It is available in the WaveForms software (version 3.6.8 or newer) for the original Analog Discovery, the Analog Discovery 2, and the Electronics Explorer board. To open the Impedance Analyzer after opening up WaveForms and selecting the attached instrumentation tool, choose the Impedance tool. 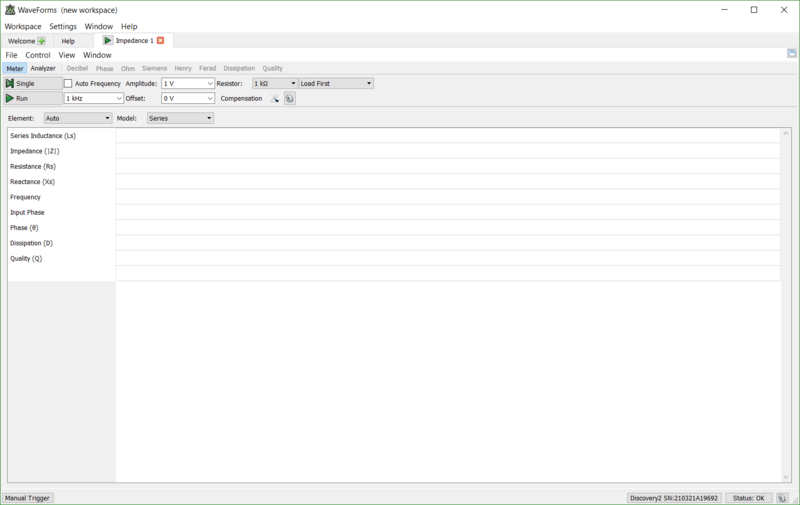 A number of options are available at the top of the GUI including File, Control, View, Window. As shown in the view menu and the main toolbar, a variety of different measurements can be taken for the system. The Meter View shows all of the available measurements simultaneously but only for the calculated -3 dB of the system. 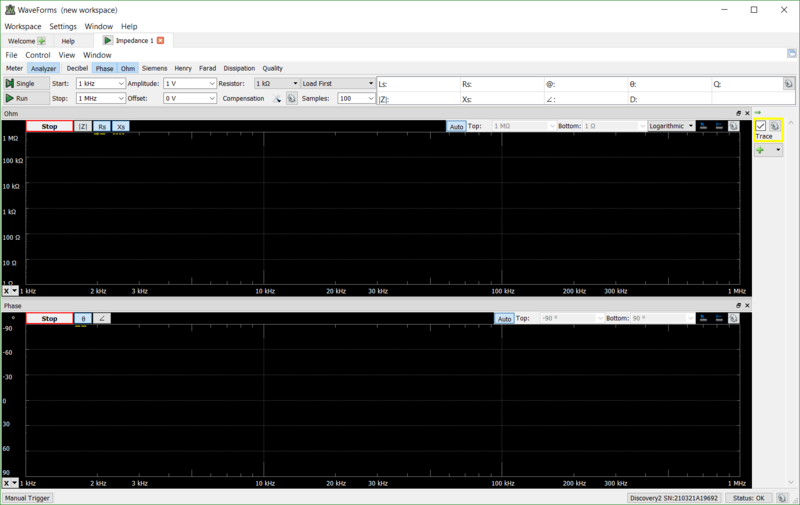 The Analyzer View shows the measured and calculated values that are toggled (highlighted blue) by the user over the specified frequency sweep. A number of the views have multiple values associated with them; for example, the Ohm view allows users to toggle and view the Impedance, Resistance, and Reactance of the system. A number of settings to manipulate the frequency sweep are available including the start and stop frequency of the sweep, the amplitude of the applied signal, an offset to introduce bias, the number of samples to take at each frequency point, and the reference resistor used. 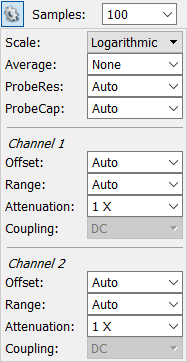 A few more settings controlling the acquisition itself are available by clicking the gear next to the Samples box to control the scale of frequency sweep, as well as offset and attenuation factors for the two oscilloscope inputs. The following images show the results of analyzing the circuit from 20 Hz to 25 MHz with a 10 kΩ with a 100 samples per frequency point. 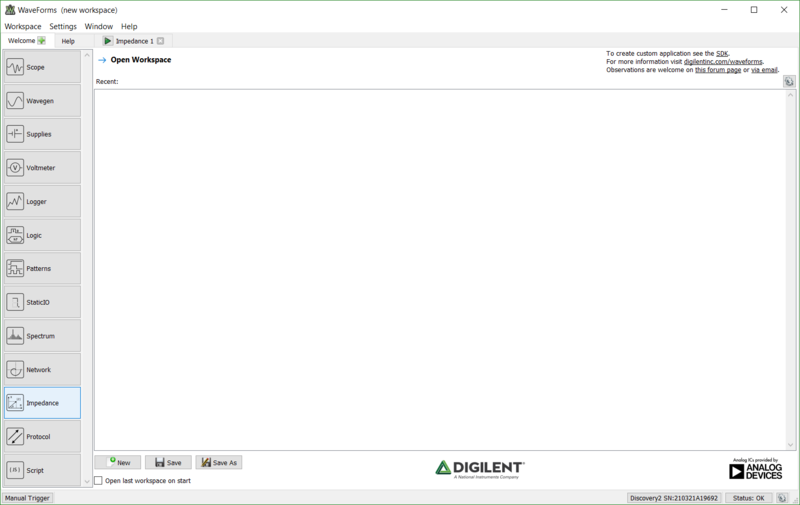 If you have any further questions about the Impedance Analyzer, please post them on the Scopes and Instruments section of the Digilent Forum.